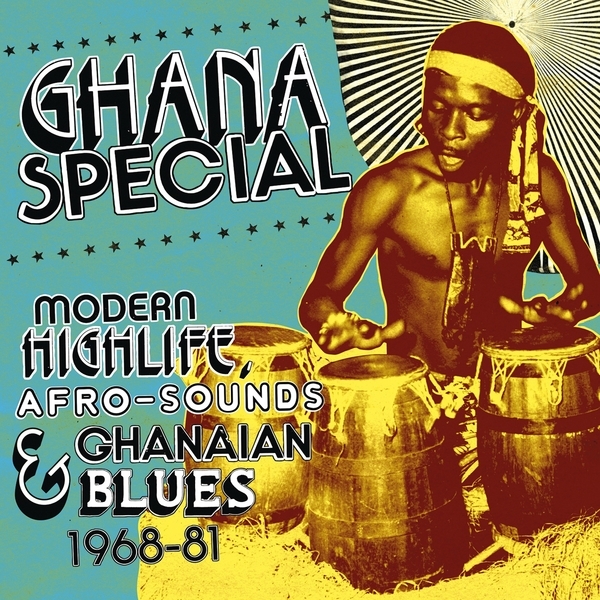 The brilliant Soundway label comes strapped with the good stuff yet again on an in-depth compilation looking at Ghanaian Blues and Hi-Life between 1968-91. Ghana in the 1970's, much like the rest of the world, was going through changes, where old musical customs and styles were colliding with the influx of American R'n'B, funk and soul, fusing together in clubs across the country and in the relatively near-by Nigeria, where Fela Kuti was brewing his potent Afrobeat style. The soundway label's Miles Cleret travelled to Ghana many times to track down the long-lost and unavailable music of this period, returning with a scorching set of 33 tracks covering obscure A-sides, B-sides and album tracks including rarities from Basa Bas Soundz feat. Fela Kuti!. As this is the 70's, access to affordable studios was more prevalent, meaning the fidelity of these recordings is of a good quality, allowing the electric licked Afro-beat of Christy Azuma & Uppers International's 'Din Ya Sugri' shines through beautifully, and making The Barbecues psyche-funker 'Ohiani Sua Efir' ripe for marauding breaks hunters (seriously, this is sooo dope!). We're smitten with this and reckon you will too. Massively Recommended!